Brain Pep, 30 vegetarian capsules (Natural Balance) - Penn Herb Co. Ltd. 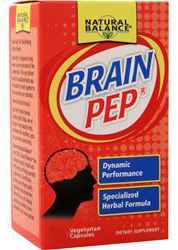 Brain Pep is designed to help keep you one step ahead of the competition. This very distinct blend of specialized herbs was formulated to work together to help maximize your potential. If you're looking for an edge on the competition, or searching for support, Brain Pep is the perfect supplement for you. AMOUNT PER SERVING (2 VEGETARIAN CAPSULES): Proprietary Blend 874 mg: Kola Nut (seed extract contains caffeine), Ginkgo Biloba (leaf and leaf extract), Gotu Kola (aerial portion extract), Eleutherococcus senticosus (root), Schizandra fruit, Ginger Root; L-Glutamine 260 mg. OTHER INGREDIENTS: Maltodextrin, Vegetarian Cellulose (Capsule), Acacia and Magnesium Stearate. Use only as directed. Take 2 vegetarian capsules daily. KEEP YOUR LICENSED HEALTH CARE PRACTITIONER INFORMED WHEN USING THIS PRODUCT.